Direct mail? Thrown away. Cold calls? Ignored. Television ads? Skipped. Banners? Blocked and ignored. It’s no wonder that so many of us in marketing are being asked to prove content marketing ROI before we even get started. As a result, consumers are tuning out the noise. Recent research shows that only one in 100 millennials says the most compelling advertisement would persuade them to trust the brand. Click to tweet: Only one in 100 millennials says the most compelling advertisement would persuade them to trust the brand. So forget interruption. It’s time for marketing to get some respect! Click to tweet: We have to stop interrupting what people are interested in and be what people are interested in. But wait. What’s this secret I talked about? 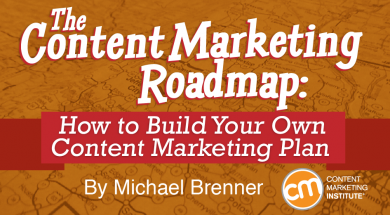 The secret is that content marketing doesn’t have to be that hard. I’m not saying it’s easy either. I define content marketing as the overlap between what brands have traditionally produced and the stuff in which consumers are actually interested. Click to tweet: The buyer journey is nothing more than a series of questions that must be answered. It doesn’t mean we have to be as funny as The Onion or use BuzzFeed-like quizzes that reveal which Disney character you are. And it doesn’t mean you have to be as thoughtful as The New York Times. It does mean that you have to commit to creating content that people want to read. Click to tweet: You need a customer-obsessed culture of content. We know from annual CMI research that effective content marketers don’t just have a plan, they have a documented content marketing strategy. Let’s start by understanding the most important contributors to content marketing success. Put someone or some group in charge of content marketing and make them accountable for content marketing success. Publish quality content consistently. Publishers publish every day. So must brand publishers – on each category of content and topic you cover. Map content to consumer journey. There are many more people in the early stages of the buyer journey than there are people who are ready to buy. You have to understand how people move from asking “what is” and “why is this important” questions to “how do I do it,” “who does it,” and “how much does it cost?” Balance your content production accordingly. Most brands focus too much time, energy, and resources on the fewer late-stage consumers. Balance paid, owned, and earned media. The best content marketers start with owned content to see what resonates on social and creates customer engagement. Then they bet on the winners with paid media. Focus on subscriptions. Subscriptions are like magic. They sit between reach, engagement, and conversion. They act as an amazing lever for optimization. We have shown that subscribers convert to something that a business truly values (leads, e-commerce sales, event registrations, etc.) at as much as 10 times the rate of the average non-subscribing content consumer. Track content marketing ROI. It makes sense that those who are able to show ROI start with a strong business case and then simply commit to measuring their progress. Here is the framework we use to take brands through the development of a detailed content marketing plan. In a simplified way, this plan template asks who, what, when, where, why, how, and how much questions that any good plan answers. But it also details interesting brand dilemmas like the specific business case, how much branding your content hub should have and where it should live. It goes through the team, topics, and customer paths, and forces you to think through which metrics you can measure and how you will optimize. We will become [a, the largest, best, most interesting] destination for [target audience] interested in [topics]. To help them [customer value]. Here is a simple template for measuring your content marketing efforts. You can certainly look at more and different measures, but we have found these are the metrics used by leading brands to help them understand how their content sites are performing over a trended period. You could add some honorable-mention metrics such as visitors, repeat visitors, engaged visitors (those who spend more than a minute or read more than one page). And of course it’s always important to see which articles, authors, categories, and topics perform the best overall, especially socially and organically. More on that below. I often am asked about how much to balance the content marketing budget among paid, owned, and earned. I suggest you start by looking at your metrics. Half of your traffic or more should come from organic sources (search, direct, social). While everyone agrees that brands need to publish only the highest-quality content, the data will show that there is little diminishing return from publishing more content. Brands that move from publishing monthly to weekly to daily and multiple times a day see increasing rates of return in the form of engaged traffic. It’s only when you go from a few times a day to multiple times a day that we see the rate of increase diminish. But there is still an increase in traffic and engaged traffic with increased volume. So make sure you spend enough of your budget on publishing a high volume of great content. Then see what gains the most engagement in social and put your paid media behind that “best of” content. My friend Andrew Davis taught me about the “Hollywood model” of budgeting where 40 to 60% of a movie budget goes to the production of the content and 40 to 60% of the budget goes to distribution. So start with that basic rule of thumb, then measure what works for your audience and your brand content. I am hoping that with this approach, you also find that building your content marketing plan isn’t that hard. If you have additional questions, see my list of top content marketing questions answered. What do you think? Easy, right? Please let me know what you think or ask your questions in the comments below.